As part of our focus on LAMMA 2018 at The East of England Show Ground in Peterborough on Wednesday 17th and Thursday 18th January, Tuffa has taken a look at the updates introduced earlier this month for the Government’s Oil Storage Regulations for Business. We’ve also investigated regulations and grants available for Welsh farmers. 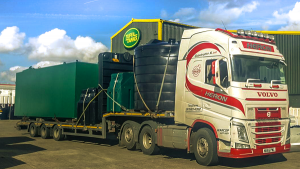 Tuffa Tanks can help the farming and agricultural sector meet all liquid storage legal requirements. These storage regulations apply to Diesel, Kerosene (Heating Oil) and Waste Oil. “Fixed tanks must be bunded. Other containers can be bunded or use drip trays. The good news is that there are Farming Business Grants (FBGs) available now to Farmers in Wales. They can help with the cost of meeting the legal obligations on liquid storage and secondary containment. The Welsh Government has made £40 million of funding available for farms in Wales over 4 years. The minimum grant available is £3,000, with the maximum £12,000. Welsh farmers will only be allowed one approved application per business throughout the lifetime of the scheme. If you are successful, your approved FBG can provide a 40% contribution towards capital investments in equipment or machinery that has been identified as offering a clear and quantifiable benefit to farms. Administration of the FBG will be transferring to Rural Payments Wales (RPW) for the current round of applications from January 29th – 2nd March 2018. You can find out more about FBGs here. In addition, you must have attended a Farming Connect “Farming for the Future” event to ensure you are eligible to make an application. You can find a list of event dates and venues here. Tuffa UK supplies a range of liquid storage solutions including Oil, Diesel, Chemical and Waste Water Tanks. Tuffa can help you comply with all liquid storage and secondary containment legal requirements. We supply bunded Oil, Diesel and Chemical tanks as single or multi-compartment tanks in either plastic or steel. Plastic tanks range from 1350 to 20,000 litres. You can increase capacity by interlinking tanks. Tuffa manufacture steel tanks in any capacity up to 200,000 litres. Our team can design and produce a Tuffa Tank as a bespoke product to your exact specification. We also offer a full delivery and installation service where required. In addition, there is a complete range of spares and accessories and a choice of servicing packages. We can provide farmers and the agricultural sector with competitive, secure liquid storage and help with compliance on all current legal requirements. Please call our sales support team on 01889 567700 or contact us here to find out more.